Newfies-Dialer is auto dialing software. Auto-Dialing is a process whereby telephone numbers are automatically dialled and on answer, the system will identify whether the call has been taken by a person or a machine. 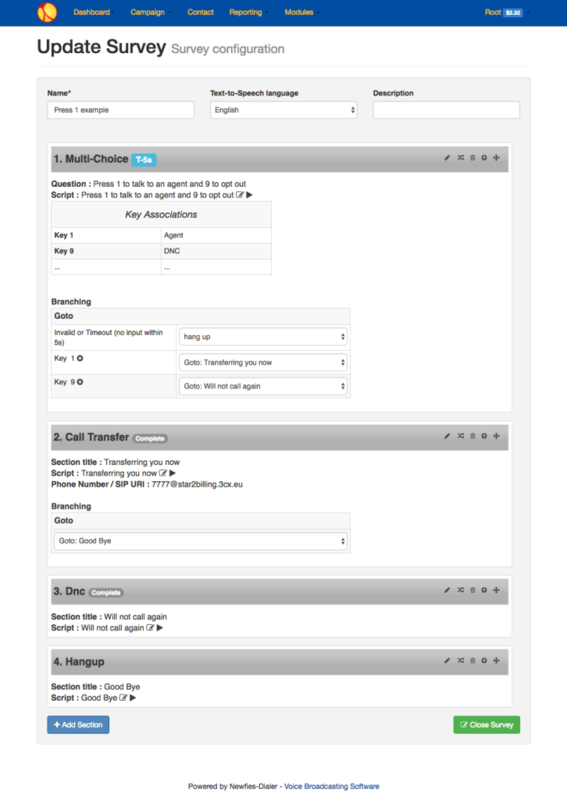 At this point, Newfies-Dialer can be configured to take a number of actions. If the call is answered by voicemail, auto dialing software can either leave a message after beep, which is in itself is a valuable marketing technique, alternatively it can hang up the call in order to save call costs. If the call is answered by a real person, Newfies-Dialer can then respond with an IVR, for instance, play a pre-recorded message explaining the proposition and invite the callee to “press 1 to speak to an agent”, or simply transfer the call directly to an agent in a call center without playing any message. Newfies-Dialer has a range of features that are useful for voice broadcasting, and particularly for those who want to sell voice broadcasting services to their customers including multi-tenant operation, billing for your customers and credit card integration. Newfies-Dialer is capable of handling thousands of concurrent calls, and hundreds of thousands or millions of calls daily, although smaller systems are available. Contact us to discuss your requirements and to set you up with a live demo of our auto dialing software, Newfies-Dialer.